Local government is an essential component of democracy as it is the closest level of government to the community. It is usually in the best position to identify and respond to community needs. 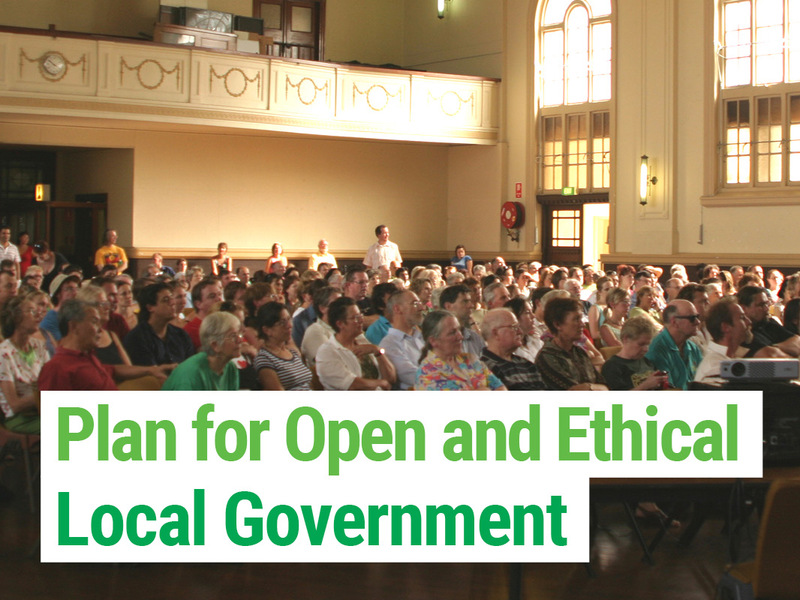 The Greens are committed to Local Government which is Open and Ethical and will ensure that the community is always put first and that all processes in council are transparent, accountable and fair to all. Ensure all council and committee meetings are open to the public except where there are formal grounds for confidentiality under the Local Government Act. Ensure all citizens have the right to address all Council and Committee meetings on any matter on the agenda without pre-registering. Foster a culture of nonviolence in councils that delivers inclusive, non-aggressive decision-making which is fundamental to good local government. Require that the Councillor Code of Conduct protects and facilitates the right of Councillors to provide information to the public and to participate as citizens in public interest campaigns and activities. Guarantee that the public has the right to free and ready access to public interest information held by councils and that GIPAA (Freedom of Information) requests are free of charge. Make sure the pecuniary interest returns of Councillors and senior council staff are available to the public for inspection at all council meetings. Record all Council meetings and the voting of individual Councillors and ensure free public access to such recordings. Provide webcasting of council meetings. Put a spending cap on local council elections and require continuous disclosure of reportable donations. Guarantee where council amalgamations or boundary changes are proposed that a referendum in each affected council area is held requiring a majority vote in each area for any boundary change or amalgamation to proceed. Greens Councillors and Mayors have already been effective in bringing greater transparency and accountability to local councils across NSW. Some of the achievements of past Greens Councillors on their local council have been the requirement that their local council meetings be recorded and the public given access to these recordings; the introduction of free GIPPA (Freedom of Information) requests; the establishment and resourcing of local Residents Precinct Committees and the opening up of council and committee meetings to the public. The outcome of local government elections should not be determined by the amount of money a party or individual spends on the election campaign. There are spending caps for state elections but no limits for local council campaigns. This effectively enables political parties with big bank balances or wealthy donors to as good as buy local council elections. The Greens are calling on all political parties and all independents contesting these elections to give the voters the facts and release their total election spend and reportable donations prior to the council elections. The Greens have continuous disclosure of reportable donations and will release the Greens’ total campaign spend well before the council elections.